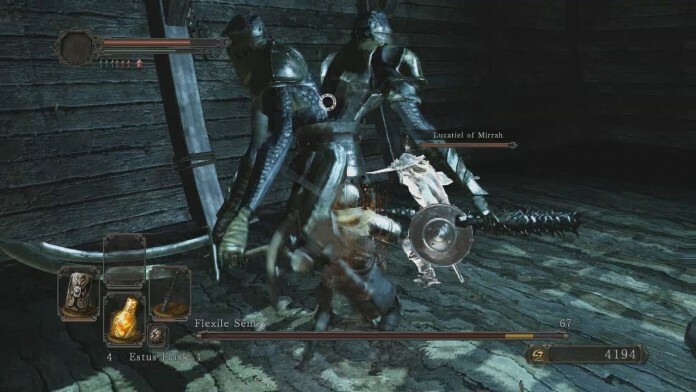 Uh, this Flexile Sentry guy is really an interesting boss fight in Dark Souls 2 – a double fight in one, with few possibilities to attack and with a room that gets filled with water as you fight, making fast movement more difficult. We are here to share with you how to beat Flexile Sentry in Dark Souls 2, a really challenging boss that it’s best to deal with from afar. This being said, our suggested approach is by the use of magic: stay away from all the action, running and jumping to the sides, waiting for the boss to attack, then sending a soul arrow his way. You risk losing the least health by going with this method and you will easily beat the boss, avoiding all direct contact which can prove lethal. But if you are a warrior by heart, you will want to go close with melee attacks against this two headed monster and here is where the most fun will be, but also the biggest challenge. In order to beat Flexile Sentry, you should pay close attention to his moves and especially rest habits. The trick is, since he’s a two sided fighting machine, to attack from the side after an attack. So always be on the move, trying to create a circle around this boss, and when he’s resting after an attack, rush in and start hitting. It will take you a bit longer than the magic approach, but you will probably have more fun too. I hope that you found this guide useful and managed to beat this boss easily after reading it!